Is Pakistan a failing or a failed state? This question is being asked the world over. Folks at home contemplate the same question in more direct terms: is the country going to break up once again? A non-committal answer, somewhat like ‘teetering on the brink’, makes everyone get on with business as usual as best as they can. The interests of those abroad and those at home, however, are poles apart. On behalf of the world, Hillary Clinton is worried about Pakistan’s nuclear weapons falling into the hands of advancing terrorists. The worry at home is less grim but more poignant. People running away from violence in Swat, Dir, Buner and other battlegrounds wait and wonder when they will be able to return home and send their children to school. The American fear and the misery of the displaced families at home both arise from the inefficiency and indifference of the institutions of the state. Individual ambition and wrong policies have diminished our institutions but they still exist and sometimes make their existence felt as they are deeply rooted in history. Pakistan, therefore, can still pull back from the brink if our political leaders and parties even now concede the fundamental truth that countries are sustained by institutions, howsoever weak, and not by individuals, howsoever strong. It is for reasons of institutional support that the world at large and the people at home draw comfort from Gen Kayani’s promise of ‘victory against terror and militancy at all costs’ but cynically dismiss the debate in parliament as mere bluff and bluster. The army as an institution has suffered the least damage and has also been able to withstand political onslaught and recover from the humiliation of defeat. Unlike the armed forces, the political, legislative administrative and judicial institutions are no longer feared or respected. When Prime Minister Gilani feels persuaded to declare that ‘we in parliament are no puppets’ he surely knows that the people think they are. And when an outraged minister, Babar Awan, asserts that the law of Pakistan reigns supreme in Swat despite the special regulation, he knows full well that it does not. Gunmen do not read the law; they see it enforced — but nobody is doing that. Pakistan remains exposed to all kinds of internal stresses and foreign blackmail because its political leadership has not been able to make certain essential decisions relating to the structure of the government and its policies. All institutions, the Supreme Court included, appear transitory and divided. 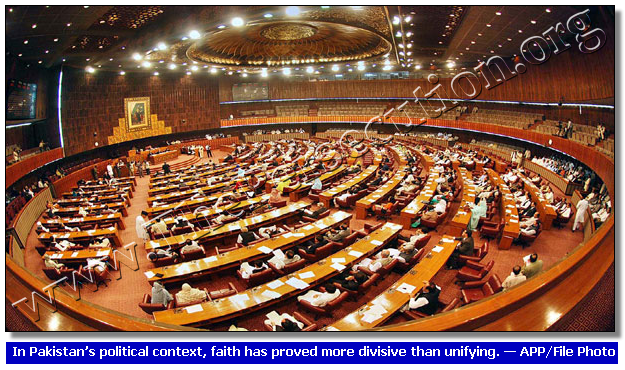 For more than a year we had a chief justice in office and another riding the crest on the streets.After a long and costly tussle it was agreed by all to restore the parliamentary character of the constitution but the National Assembly after a long, desultory session adjourned without forming an all-party committee which was to review Musharraf’s 17th Amendment that had made it presidential in all but name. Thus while the parliament is said to be supreme and the prime minister, so to say, is the chief executive, to the people at home and governments abroad it is President Zardari who really matters. It has also been agreed among all parties that the provinces must get greater autonomy and a new formula is said to have been devised for the distribution of federal revenues among the provinces. But in more than a year not even a tentative move has been seen in that direction. The future shape of the local government and the restoration of the district/divisional administration as it stood before Musharraf disbanded it also remain subject to speculation or haphazard action. Greater provincial autonomy will surely have a calming effect on the anger and insurgency in Balochistan where time is running out and in fact has run out if Governor Magsi is not being an alarmist. And the political agents in the tribal areas with their enhanced power and prestige can revive the hierarchy of the elders that has broken down under the pressure of armed militants and their doctrinal patrons. The best chance of bringing peace back to the tribal areas and Malakand Division (Swat, Dir, Buner, Chitral, etc.) lies in dealing with the tribes through their own elders following their own traditional codes and treaties with the government — not under special regulations. The puritanical social values imposed by the militant clerics would give way to normal conservative but tolerant and hospitable behaviour once the tribal hierarchy regains its lost authority. The army can kill or drive away the infiltrating fighters but only an autonomous political service would be able to organise the tribes to exclude the fanatical mullahs from the power structure. Besides reinstating the rule of power vesting in institutions and not in individuals, parliament and the Supreme Court must undertake a review of the relationship between state and religion. It is hard to deny that violent campaigns for Sharia directly flow from the constitutional provisions that make Islam the state religion and also bind the state to bring all laws ‘in conformity with the injunctions of Islam’. Maulana Sufi Mohammad can justifiably claim to be fulfilling a responsibility that is imposed by the constitution on all citizens. The path to terror in Swat and elsewhere is blazed by the constitution of Pakistan itself. In Khyber Agency, rival lashkars are pitched against each other with their competing interpretations of Islamic injunctions. Some 35 years ago the parliament of Pakistan determined that the Ahmadiyya community was not Muslim. Is it not poetic justice that Sufi Mohammad should now determine that the lawmakers of Pakistan, one and all, are infidels? Come to think of it, all parties claiming to be religious are, in fact, sectarian and the Taliban is the most violent manifestation of this. 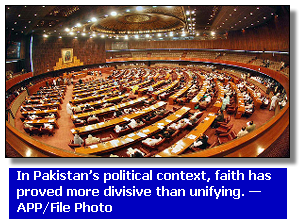 In Pakistan’s political context, faith has proved more divisive than unifying. It is a different matter though of not much concern to Sufi Mohammad that the vast majority does not agree with him on what those injunctions are. Sunnis belonging to what is commonly known as the Barelvi school and Shias (who are believed to be one-fifth of the population) openly denounce Sufi Mohammad’s campaign and accuse the government of abject surrender to his blackmail.